The total number of general entrance examination applicants for 2018 has been counted. The total number of applicants came to 156,225 - 9,329 more than the previous year. 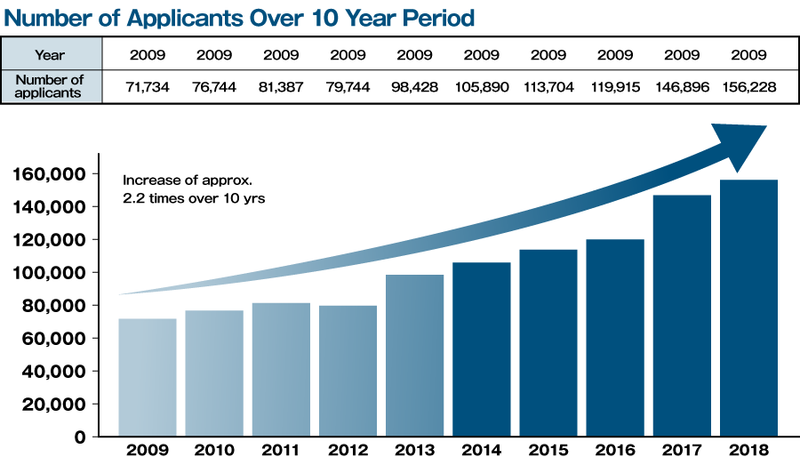 Further, the number of applicants for all entrance examination types was the most in the history of our institution, 203,404, which is 10,947 more than last year. Mr. Kenji Yasuda of DAIGAKUTSUSHIN Corporation said of this result. "The reason for the increase in the number of applicants is Kindai University's continuing commitment to successively implementing facilities for an innovative educational environment, such its library space, ACADAMIC THEATER, with it's 70,000 books, including 22,000 manga books, 24-hour study rooms, and it is also due to the high level of research undertaken such as its model work on Bluefin tuna." Furthermore, the Times Higher Education World University Ranking, published by Britain's Times Higher Education Magazine has for the last 3 years consistently placed Kindai University at the top of rankings, and has recognized the high standard of the reputation of our research abilities. We believe the increase in applicant numbers is due to the 4 reasons listed below, as well as prospective students highly valuing the continuous reformations being made to our educational and research environments. In addition to an 18.2% increase in the Kanto area, as well as 15.9% in the Hokuriku area, the number of applicants in areas other than the Kansai region have increased significantly - as well as predictable increases in the local Kansai area, of 5.7%. Nationwide recognition of the university was enhanced by active promotion efforts of research activities such as the Bluefin Tuna research being undertaken, and of the Higashi Osaka Campus Large Scale Reconstruction Project "Chou Kindai Project". We possess a diverse student body; while more students are choosing to study the humanities over science, Kindai University has an arts to science student ratio of 1:1, and we have a wide range of subject matter to study is offered. Our ACADEMIC THEATER buildings opened at the Higashi Osaka campus in April 2017. It represents a groundbreaking learning environment with facilities such as self-study rooms that open for 24 hours a day and a library space with about 70,000 books, including about 22,000 manga books. This new space has been a hot topic in media, which has led to more recognition for our university. *1 Including applicants who used the standardized National Center Test (excluding the Junior College Department). *2 Number of applicants (including the Junior College Department) for all entrance examinations, including recommendation-based entrance examinations (general recommendation). NB: Number of applicants counts only general entrance exams, including evening courses, etc. Kyoto University's figures include their Law Department's special entrance exam (latter term). Numbers of applicant figures are accurate as of March 31st.